I have come to know this surf spot well over the past few months. As the dirt road slopes down towards the beach, I can pretty quickly tell what the conditions are going to be like. Today, as I get lost in a moment gazing out to a still ocean with well-organized sets rolling in, my Nespresso and almond milk combo jiggles over the lip of my oversized white porcelain mug. I wipe the coffee off my leg with my sleeve and drive to the parking area waving hello to a few of the regulars I’ve enjoyed getting to know here. After months of paddling out into the unknown, learning to read the waves, and being with my fear, love has kicked into gear. My relationship with surfing is changed. 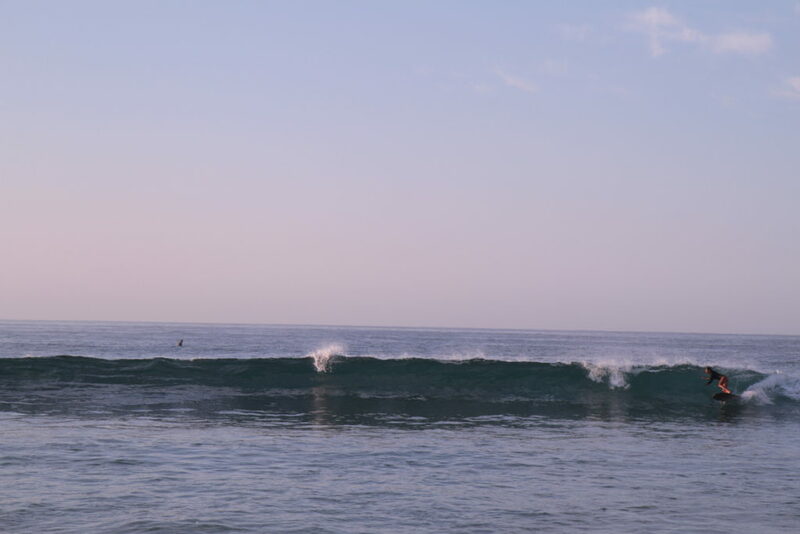 I paddle out and know where to pause at the point when a set rolls in. I sit on my board and watch what once would have made my heart race pass through. I look out to the group of surfers and see one catch a beautiful left and ride it all the way in. The set passes through, and I make my way out to a spot that draws my attention, exchanging a few more hellos and short chats with the many friendly faces that I have come to know. I catch wave after wave. Joy floods my body, and I am smiling ear to ear. I play around with my speed on the wave, applying pressure to my front foot to go faster and to the back of the board to slow down and turn. Holy moly! I am flying across the wave from the point to the beach! It took patience and some dedication to go out day after day when I was overrun with fear. But some little flicker of passion within kept me going. “Paciencia,” they say here. “Paciencia,” was a guiding value of my integration into life in Baja. I brought patience into my work and business, patience into time with my daughter and patience into doing dishes instead of focusing on a dishwasher’s absence in our home here. I am conditioned to make things happen, but lately I am discovering wisdom in waiting for the right wave and the right opportunities instead of hopping in just beacuse. Through surfing, I also learned about how fear gives way to isolation. During the many days I went surfing in fear, I stayed out on the periphery of the waves by myself. I rarely smiled because I was so focused on the many perceived dangers around me. Now feeling much more relaxed in the water, I understand what it means to be in the aloha. Joy can’t help but flow through when we do things we love, and I have to tell you that combining an immersion in nature, swimming, friendly people, salt and sun has me singing! Now, I can even spot that lone soldier who not too long ago was me. He or she sits outside, eyes somewhat bulging, face flat. He might seem sour or even mean. Today, I paddle over to a guy who fits the description and strike up a conversation. He’s calms and starts to make his way in to where the waves are breaking. For all of us who are in fear, it only takes one friendly face to shift a whole experience. It’s that first friend who asks you sit at their lunch table in a new school effect. I remember who the first person to be friendly with me in the water was, and I happily pay his goodwill forward out there. So let’s understand that about choosing love, too…when we first start choosing love, it can feel isolating. We’re sitting alone in church or at a yoga class. We don’t know the rituals or the moves. Or we start to be left out of a friend group we’ve had; suddenly we feel kicked out. We are lonely because of our fear, not our love. A consistent practice in choosing love may take days, weeks, or like me, years, before love really starts to take hold and shine through. Because that’s the thing about love…it SHINES THROUGH from the inside out. We can’t give others what we don’t have ourselves. So when we are growing and expanding, sometimes the new capacity takes time to develop and own. If you’re reading this and you feel like you’re choosing in alignment with your values and things aren’t yet working, keep choosing. Stay connected to that still small voice within that tells you to get back out there one more time. I promise you, when you stay committed, love will take hold. This is true in love and in surfing! Photo cred: Thanks for this one, Cristian Cortizo!